Product #1875 | SKU NI352DAF | 0.0 (no ratings yet) Thanks for your rating! The AF NIKKOR 35mm f/2D Lens from Nikon is a compact and lightweight wide-angle lens useful for a broad range of applications and its fast f/2 maximum aperture makes it ideal for low light shooting as well as fast shutter speeds when shooting hand-held. 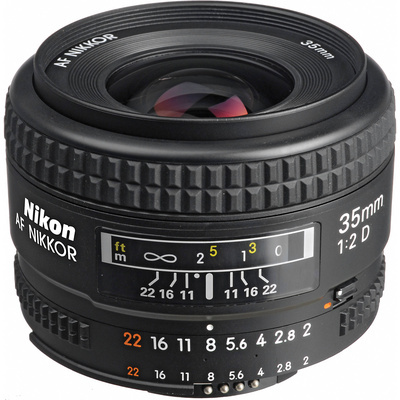 I t provides a 52.5mm focal length equivalence when used on DX format Nikon DSLRs . The lens weighs just 7.2 oz making it a great lens for travel and everyday use. Nikon's Super Integrated Lens Coating improves light transmission, reducing ghosting and flare and it a ccepts 52mm filters. An integrated aperture control ring enables manual control of exposure in addition to AE control through the camera body. For programmed auto or shutter-priority auto exposure shooting, use the minimum aperture lock lever to lock the lens aperture at f/22. Autofocus is not supported by D40, D40x, D60, D3000, D3100, D3200, D3300, D5000, D5100, D5200, D5300 cameras--lens may be used with manual focus only. Be sure to cheque your camera's lens-compatibility information before selecting a new lens.